St. Simons Island is always humming with a variety of fun activities and things to do year-round. From local farmer's markets, art and antique shows, Music in the Park, outdoor excursions, to wine tastings, gallery exhibits, tours, and on-going classes and workshops for creative pursuits such as painting, pottery, jewelry making or dance instruction, you'll never run out of things to do in the Golden Isles. Listing your event on the ExploreStSimonsIsland.com website is FREE. The Events Calendar has now been updated with current 2019 information for upcoming events! PLEASE NOTE: EVENTS SUBJECT TO CHANGE WITHOUT PRIOR NOTICE. PLEASE CALL THE LISTED PHONE NUMBERS FOR CONFIRMATION. Glynn Visual Arts : 529 Beachview Dr. Call 912.638-8770 or visit glynnvisualarts.org. McIntosh Art Association : 404 Northway, Darien. Call 912.437.7711 or visit mcintoshartassociation.com. FREE meetings each month at Frederica Presbyterian Church to help with general life coping skills, work, relationships, financial matters, illnesses, etc - call 912.577.8119 or visit freddypresssi.com. Wine Tasting at Waterfront Wine & Gourmet of Darien. Call 912.437.3410 for days and details. 10am - 11:30am. Children ages 7 and up will enjoy instruction by Debbie Craig. Classes are ongoing and drop-in. Glynn Visual Arts Pottery Studio, 106 Island Drive. Call 912.638.8770 for more information or visit glynnvisualarts.org. Enjoy a guided nature walk with local wildlife and eco experts who help explore the beaches of Jekyll Island and its marshes, dunes and maritime forest during year-round tours. Visit Tidelands Nature Center at 100 Riverview Dr., call 912.635.5032 or visit tidelands4h.org. 6:30pm - 8:30 pm. Classes are ongoing and drop-in. Glynn Visual Arts, 106 Island Drive on St. Simons Island. Call 912.638.8770 for more information or visit glynnvisualarts.org. Every Tuesday, Thursday and Saturday, 8am til dark. Call 912.262.6665 for more information. Storytime Stories and craft projects for younger children. 10:30am at the Brunswick Library, 208 Gloucester St. Call 912.267.1212 or visit trrl.org. Village Creek Landing on St. Simons Island hosts an Eco-Lecture Series at 6pm on the third tuesday of each month. 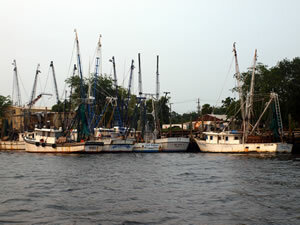 A new guest speaker each month will discuss eco and environmental topics regarding the preservation of Coastal Georgia. Sip a cocktail while enjoying the lovel marsh view. Cost is $10 per person (includes your first drink). Space is limited. RSVP online at VillageCreekLanding.com or call 912.399.0063. 1:00pm - 4:00 pm. Glynn Visual Arts, 106 Island Drive on St. Simons Island. Call 912.638.8770 or visit glynnvisualarts.org. Morning classes 9am-11:30am and evening classes 6pm - 8:30pm. Instruction in wheel and hand building by Debbie Craig. Classes are ongoing and drop-in. Glynn Visual Arts, 106 Island Drive, St. Simons Island. Call 912.638.6679 or 912.638.8770 or visit glynnvisualarts.org for more information. Seaside Dance Association provides Dance Instruction/Practice, social and ballroom dance. Beginners 7pm; Advanced 8:15pm. $5 members, $8 non-members. Held at the St. Simons Elementary School cafeteria, 805 Ocean Blvd. For more information call 912.634.9527. Events take place on the 4th Thursday of the month at 6:00pm and routes begin and finish at the happy hour destination and will be a leisurely couple mile ride. Please click here to view the full schedule. The rides are free and no reservations are required. Brunswick welcomes you to area shops, galleries, restaurants, art openings, live music, food and beverage samples. From 5-8pm. Call 912.265.4032 or visit brunswickgeorgia.net. 10-11:30am. Children ages 7 and up will enjoy instruction by Debbie Craig. Classes are ongoing, drop-in. Drop-in class $18. 6 Classes for members $95. 6 Classes for non-members $105. Clay $13 for 12 lbs. Call 912.638.6679 or 912.638.8770 or visit glynnvisualarts.org for more information. Hundreds of locals and visitors alike join together for this live music event at Gascoigne Bluff on St. Simons Island the second Sunday of every month from 1-7pm. The proceeds from Second Sunday benefit various local charitable organizations. Bring your lawn chairs, blankets and coolers and enjoy listening to the live music. Raffle tickets are sold for door prizes contributed by area businesses. Kids can play in the inflatable bounce house and slides. Flowers as subject matter for art is not new. There is a reason flowers have such staying power in our imaginations. They consistently evoke beauty and a range of emotions, colors, ideas, memories, abstractions and more. Whether in a single stem, an arrangement, a garden, as part of an overall landscape, or growing in the wild, flowers have power. We are drawn to them. Flowers in gardenscapes, landscapes, or in your own imagination, mindscapes, will be the theme of this exhibition. Katherine is a painter, illustrator and maker living and working in Savannah, Georgia. She specializes in paint and fibers-based works and also creates installations from native and upcycled or repurposed materials. She relies on research, a conceptual framework and storytelling while working with beautiful and meaningful materials. Additionally, she create concepts and build strategies for visual communications for businesses, organizations and individuals. Five island Art Galleries will participate in a Art Crawl. Offering wine and great wine. Located at intersection of US17 and GA99, one mile east of I-95 exit 42. Take an eerie journey back in time at Coastal Georgia's most haunted rice plantation. On select weekend nights this spring, Hofwyl-Broadfield Plantation State Historic Site will be offering Ghosts and Legends walking tours of the site. We will walk beneath centuries old Live Oak trees, explore the plantation out-buildings and finish with a lantern tour of the plantation house. As we stroll through Hofwyl-Broadfield's moss laden trees hear the stories of five generations of plantation owners and the African-Americans who worked here, in both slavery and freedom. There will be tales of recent ghostly encounters, plantation folklore and the rich but tragic history of the Lowcountry rice fields. Hofwyl-Broadfield Plantation is owned and operated by the Georgia Department of Natural Resources. Call 912.264.7333 for more information, also you may visit gastateparks.org. Join us at Hofwyl-Broadfield Plantation on April 6th for our annual Easter Egg Hunt. The event lasts from 1 p.m. until 3 p.m. There will be over 3,000 toy filled eggs in three hunt areas for kids aged 1 to 3, 4 to 6 and 7 to 10. Special guest, "The Easter Bunny" will be on-hand throughout. Call 912.264.7333 for more information, also you may visit gastateparks.org. Description: Spring arrives with artistic flair this April as Glynn Visual Arts hosts their 26th annual Art in the Park Fine Art & Craft Festival. Over 60 talented artists and skilled crafts people from the around the region display an impressive and eclectic collection of handmade artwork. Attendees will enjoy a wide variety of two dimensional art, sculpture, jewelry, ceramics, photography, textiles, wood, metal and glass. Homegrown beauty products, botanicals and gourmet goodies are also available to delight the senses. Food vendors serving freshly prepared eats will be available as well. Music and kids' craft activities at our kids' "Creation Station" area add to this fun event. This festival is held in the beautiful live oak covered Postell Park in the heart of Pier Village, just steps from the ocean on Saint Simons Island, GA. Adults $72; Children ages 6-12 $25; Children 5 and under no charge. Prices include Coffee, Decaf, Hot Tea, and Iced Tea. ArtTrends Gallery on Saint Simons Island is the only co-op gallery on the island. It is owned and operated by 8 local artist. The gallery will be celebrating entering into 5 years. The gallery will be full on new exciting local work. Join us for Leadercast: St. Simons Island on Friday, May 10 from 8:30 am - 4:00 pm. Tickets are $129. Catered lunch included. Seats are limited. Register now! Leadercast Live is the largest one-day leadership event in the world, broadcast live each May from Atlanta to hundreds of Host Sites around the world. Featured speakers include Patrick Lencioni, Andy Stanley, Gayle King and more. In 2019, the Leadercast Live stage will showcase these leadership experts to help attendees master the art and science of developing and leading healthy teams. Lifestyle Sandbox is hosting the simulcast live from Atlanta at Sea Palms Resort on St. Simons Island. Participants will sit at round tables designed for conversation. Bring your team or meet new thought-provoking leaders to move your business and projects forward! Join us for another fun, modern handmade night market on May 10th down at beautiful Old City Hall in downtown Brunswick, GA! We'll have food trucks, live music, and of course our usual diverse group of awesome handmade makers. Bring the whole fam (your pup, too) and enjoy our sweet community for a night of fun and supporting local artists. See you there! Artists, handmade crafts and vendors gather under the trees in Neptune Park for a fun day of local festivities! Times: 11 a.m., 1 p.m., and 3 p.m.
Visit the GVA website for current events, workshops, classes and ongoing activities. Come listen to sequential artist, Bob Pendarvis, as he discusses the art of storytelling through images. Bob is a professional artist and created the Sequential Art program at Savannah College of Art and Design. Spend some creative time with a friend or family member or make it a date night and bring your own libations for this fun two hour mosaic holiday workshop. We will be adhering the stained glass to holiday themed wood cut-outs to create beautiful one-of-a-kind holiday ornaments for yourself, or as gifts for your family and friends. Basic mosaic techniques will be covered, all materials included. Our local pottery studio members are raising money to buy much needed equipment for the pottery studio! They have donated some of their best work and 100% of your purchase goes directly to the purchase of the equipment. Come learn this compelling and fun new art form, acrylic paint pouring. Casey Corbin is back for December to take you on a fun, fabulous journey where you will learn to create unique art for yourself! Perfect for ALL levels. Choose the morning session or stay all day! Space is limited so make sure to reserve your spot now. Many parents have requested after school sessions and we have made that happen! We are offering pottery and art classes for kids after school beginning in January. 3 pottery sessions and 2 art class sessions to choose from. Click here to find out the details and to register. Join us the 2nd Monday of each month for our Lunch & Learn Lecture Series. Each month we present a different topic. January's presentation will be on the Art of Set Design with Jackie Gordon. Jackie has over 20 years of experience acting, directing and stage managing theatre productions. She will discuss how art movements and techniques influence set design. Bring your lunch and come learn with us! Join Ann Marie Dalis as she helps you to improve your drawing skills in 2019! Beginners, intermediate and more advanced artists will find the Elements of Art and Principles of Design more intuitive after this class. We will practice line, drawing shapes and changing them into forms with shading, proportion, relationships of objects, and creating a more pleasing composition. We will learn about one and two point perspective and use photos of each type perspective to practice. Students will be encouraged to use a sketchbook to log their experiences. Join this class to sharpen your drawing skills! Paint not your medium? Then try jewelry and join Lisa Kent for this 4 week class that meets on Monday evenings from 6 p.m. to 8 p.m. and learn how make fabulous and unique metal jewelry. Learn techniques for cutting, forming, and decorating, and ways to assemble pieces without soldering (cold connections). Class meets Jan 14th, 21st, 28 and Feb 4th. 6-8 p.m.
$15 supply payable directly to instructor on first day of class. Looking to add a new skill to your pottery skills?Join Debbie and learn how to create using the wheel! You must have had at least 6 hand building classes to take this class. Price includes 6 open studio sessions to practice your new skills outside of class. Once students learn to "center" clay, there will be specific projects (bottle forms, covered jars, mugs, pitchers). Students will learn how to trim their pots, "pull" handles, use calipers to measure for lids. This class is structured and challenging with a focus on specific technical skills. Please call GVA at 912.638.8770 to check space availability. Come join our pottery studio manager for these fun monthly Friday night workshops. Each month has a different project and your price includes your clay, firing and glazing of your project. The next Friday Fire will be January 25th, 2019 from 6-8 p.m.
at Mary Ross Waterfront Park every Tuesday, Thursday and Saturday, 8 am-dark. Call 912.262.6665 for more information. Explore the galleries and stores of Historic Downtown Brunswick the first Friday of every month. 5-8pm. Art, gifts and more; light refreshments served at most locations. 912.279.0023. Hear the story of the Jekyll Island Club and visit two cottages. Daily tours. Social and ballroom dance. Thursdays. Beginners 7pm. Advanced 8:15pm. $5 members, $8 non-members. St. Simons Elementary School cafeteria, 805 Ocean Blvd., SSI. 912.634.9527. Wildlife and nature guides explain Jekyll Island's fascinating beach, marshes, dunes and maritime forest during year-round tours M-W-F. Tidelands Nature Center, 912.635.5032. Infant/Child and Adult Sponsored by the American Red Cross. Locations and times: 912.265.1695. Glynn Visual Arts, 319 Mallery St., SSI. 912.638.8770. Open to the public seven days per week. Mon-Fri 12-4 PM, Sat-Sun 10AM-4PM. Gallery Exhibit changes each month. Free. For adults and children. Glynn Visual Arts, 106 Island Drive, SSI. 912.638.8770. Pottery, Hand-Building and Wheel Ongoing Classes. Glynn Visual Arts Pottery Studio, 106 Island Drive, SSI. 912.638.8770. First Tuesday of every month. 7pm. Free to adult writers at any skill level. Sharon, 912.264.5902. Third Thursday each month. 6pm. Glynn Visual Arts, 319 Mallery St., SSI. Call 912.638.8770. Located under the oaks in the historic Pier Village area, on the grounds of the beautiful revitalized Postell Park, on Beachview Drive off Mallery Street, St. Simons Island, GA. Close to restaurants, hotels, shopping, and beautiful St. Simons Island Beaches. Always free admission and parking. A limited number of vendor spaces are available, depending on the show date. For more information about spaces or just general information about the St. Simons Antique Show, Please call Joe Burkhart, at 912.267.7822 or visit the website at stsimonsantiques.com for show dates and times. Office, Gallery & Historic Ritz Theatre hours: Wednesdays-Fridays 9:00 a.m. to 5:00 p.m.
Also by appointment and during event times. The Richard S. Bolt Visitor Center is located at the Main Entrance of the Okefenokee National Wildlife Refuge, 11 miles southwest of Folkston, Georgia, off the Okefenokee Parkway South (GA 121/23). A $5 refuge entrance fee per vehicle or annual pass is required as admission. For more information, contact the Richard S. Bolt Visitor Center at 912.496.7836, 9:00 a.m. – 4:00 p.m., Tuesday-Saturday. More information is available on the refuge website at fws.gov/refuge/okefenokee, or at the Richard S. Bolt Visitor Center, located off Hwy. 121/23 near Folkston, GA by calling 912.496.7836 between 9:00 a.m. and 4:00 p.m. Tuesday - Saturday or daily after September 1. 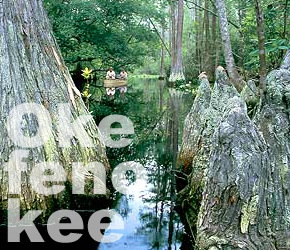 The Suwannee Canal Recreation Area (East Entrance) to the Okefenokee National Wildlife Refuge is the primary entrance managed by the U.S. Fish and Wildlife Service and is located 11 miles southwest of Folkson, GA off Hwy 121/23. The refuge is open daily and offers a variety of opportunities for the visiting public. Call 912.496.7836 or visit the refuge website at fws.gov/okefenokee for hours of operation, upcoming events, and entrance fee information. The mission of the U.S. Fish and Wildlife Service is working with others to conserve, protect and enhance fish, wildlife and plants and their habitats for the continuing benefit of the American people. For more information on our work and the people who make it happen, visit fws.gov. Connect with our Facebook pages at facebook.com/okefenokeewildliferefuge or facebook.com/usfwssoutheast, follow our tweets at www.twitter.com/usfwssoutheast, watch our YouTube Channel at youtube.com/usfws and download photos from our Flickr page at flickr.com/photos/usfwssoutheast.